It wasn’t an emergency situation. But the reason we all carry (or should carry) The Ten Essentials is that some days do not go according to plan. The previous summer we seriously underestimated the length of a long alpine scramble in Mt. Rainier National Park and turned around at 2 in the afternoon with a lot of mountain still above us. This year we started up from base camp much earlier and had better luck with the obscure route finding challenges. It was still 3 pm when we got on top. At 7 pm my partner announced that we were at a good spot to bivy. We were in open woods by a little stream. I was still intent on getting down that day, but he was correct. We found a couple of nice level spots for “camp”. He often does “day and a half” outings, so he just got out his overnight bivy gear. I got out my Ten Essentials stash. For 40 years I had been having this conversation on outings – “What if we had to spend the night? Would you be O.K. with what you are carrying right now?” Now I was actually going to find out. 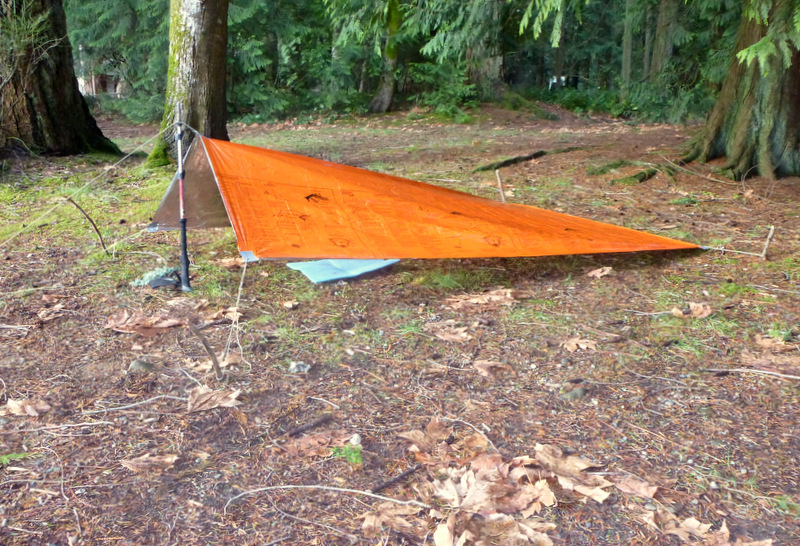 I carry a 8′ x 5′ SOL survival blanket, reflective on one side and orange on the other. I have a fully reflective emergency bag as well. The blanket is pretty durable while still only 3.2 oz. In theory it becomes a reflective shelter, pitched with whatever the site provides. I also carry two small rolls of duct tape and 50′ of 2 mm. accessory line. So now in the gathering darkness, I have to turn this and what I am carrying into camp. My “tent” is going to be 8′ from entrance to back and 5′ across at the low end. 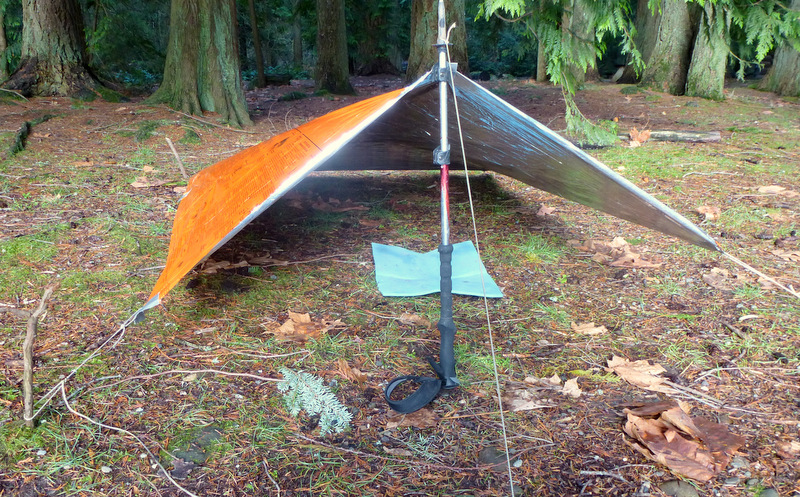 It needs four corner tie outs and one pole tie point half way on one of the 5′ edges. Each of these spots gets reinforced with duct tape and a hole pierced for the line with the awl on my Swiss Army knife that is always with me. Corners get a loop of line, with a longer guy for the front ridge point. I find four likely sticks to sharpen for tent pegs. I carry a Y tent stake as a spare and cat hole digging tool (a Mike Clelland trick). This will anchor the front guy. One of my trekking poles serves as the front support and with a little adjustment, I am set up. The blanket tent is pitched with the reflective side down to give me good radiation loss protection. It comes out pretty much as I had imagined. I refill my water bladder and drop in a purification tablet. I put on more clothes and have supper with lunch that only got lightly used during the day – Logan bread, sausage bits and Babybel cheese. I send out my nightly “In Camp” SPOT check-in message, as we are, well, “in camp”. Because my climbing partner is known for bivies, I had packed all my clothes for the day climb, just in case. But this wasn’t really much more than I often take. So what I hope will keep me warm are my long johns, nylon climbing pants, and rain chaps, with my merino wool top, nylon climbing shirt, windproof microfleece pull over, 1 lb. polar guard fill jacket and my light weight rain jacket if needed. A 2′ x 2′ blue foam sit pad that goes everywhere with me is my hip pad. I use my rain jacket as a ground cloth for my body. 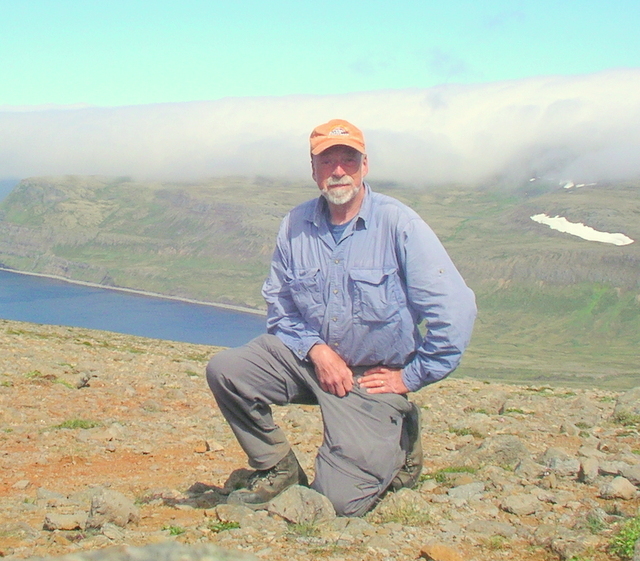 Somehow I did not pack my favorite windproof, microfleece hat, so I have to make do with my regular ball cap. I have a nice dry bed of forest duff. It is a dry night and not that cold, but is late August and we are at 4,000′. In the middle of the night I have to put on my rain jacket to be warm, but I get a lot more sleep than I expected. I have had much more uncomfortable nights on a plane. Breakfast is more Logan bread and some gorp. We still needed four hours the next morning to get down to our unused base camp, so the decision to stop was a good one. I had really intended to modify the survival blanket with the duct tape and tie out loops at some point to make emergency pitching quicker, but it finally got done in the field. The blanket repacked into a small zip lock bag and still fits with other items in my small emergency gear sil-nylon stuff sack, waiting for the next unplanned event. 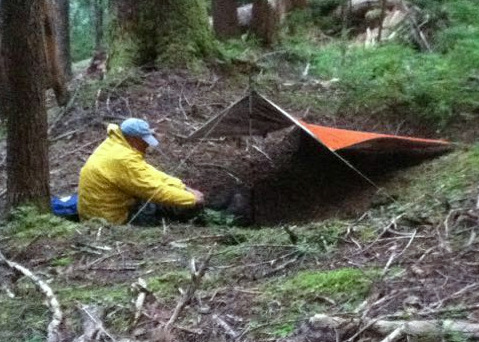 I think next time I would pitch it closer to the ground to provide a smaller, warmer shelter. The reflective emergency bag stayed in reserve. It really all worked. This entry was posted in Navigation & safety, Shelter, Sleeping and tagged emergency shelter, Mike Clelland, The Ten Essentials. Bookmark the permalink. I’m pretty impressed it took you this long to have an unplanned bivy. I’ve managed three and only one was as comfortable as the one you describe here. The other two both involved being tied in. One in a schrund in a rain/ sleet storm part way through a descent of the W. Ridge of Forbidden and the other on a ledge on…. the E. Ridge of Forbidden. Keeping warm and dry and probably hydrated seem to be the keys to survival, with the other details defining the level of suffering/ comfort that you are going to endure.